Launched in November 2005, the Venus Express space probe has been studying the “morning star” since April 2006. Armed with a full suite of science instruments, the main ones developed with CNES support, it is today revealing Venus in all its surprising complexity. Earth and Venus are of similar size and mass, and they move around the Sun on relatively similar orbits. However, while water abounds on Earth, Venus is a hellish place where the surface is the temperature of molten lead. Why did the two planets take such different evolutionary paths? This is one of the questions the Venus Express mission is seeking to answer. To understand how Venus evolved, scientists designed Venus Express’s instruments to peer deep inside its atmosphere. The gases cloaking the planet are a record of its turbulent past. For example; the VIRTIS imaging spectrometer—whose high-resolution channel was developed by the Observatoire de Paris—has measured oxygen emissions at the top of Venus’s atmosphere, on the night side of the planet. This oxygen can only be coming from the day side of Venus, where the Sun’s ultraviolet rays break down carbon dioxide (CO2)—the main constituent of its atmosphere—thus freeing oxygen. “Finding oxygen on the night side of Venus has told us a great deal about the circulation in the upper reaches of its atmosphere,” said a delighted Pierre Drossart, VIRTIS Co-Principal Investigator. This high-altitude atmospheric circulation is also the reason for another paradoxical phenomenon detected by Venus Express’s SPICAV instrument. 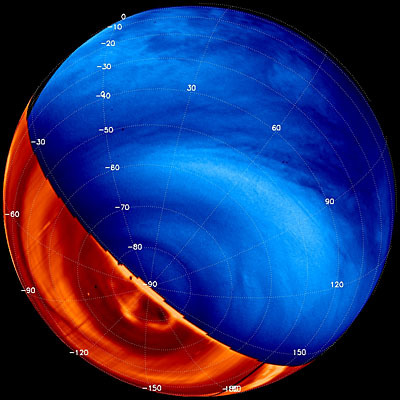 On Venus’s night side, where temperatures should normally be the coldest, SPICAV has observed a layer of the atmosphere between 90 and 110 km where in places the temperature is 70°C higher than expected. Atmospheric circulation above 100 km. The explanation is fairly simple: if you’ve ever inflated a bicycle tyre, you’ll have felt the hot compressed air as it shoots out of the pump. This is exactly what is happening with the compressed gases in Venus’s atmosphere. “We have calculated that for the atmosphere to heat this much, the gases transported from the day side to the night side must sink at a rate of 50 cm per second, which is surprisingly fast,” enthuses Jean-Loup Bertaux, SPICAV Principal Investigator. Venus Express’s ASPERA instrument has confirmed that part of Venus’s atmosphere is being stripped away by the solar wind, and that the gases escaping are mostly hydrogen and oxygen—two atoms of hydrogen for every one atom of oxygen. “Exactly the same ratio as in the water molecule, H2O,” explains Jean-André Sauvaud, ASPERA Co-Principal Investigator. This is a strong indicator that a lot of the water on early Venus may have escaped into space, and that what little water is left today in vapour form is following the same route. In the 15th century, Botticelli depicted the goddess Venus emerging from the water in one of the most famous paintings of the Renaissance, The Birth of Venus. As Venus Express has now shown us, in the real world the exact opposite is true.